Greetings from the Cornfields of IL!! I'm sitting in a coffe shop in Mattoon, IL finally able to use my computer and I had to put this up!! I'm so excited about this book!! 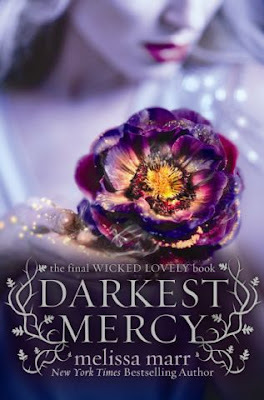 Melissa Marr's Wicked Lovely Series is one of my favorite YA reads and I can't wait for the last book Darkest Mercy to come out. The cover has just been released and I love it!! I know that an earlier version of the Darkest Mercy cover has been posted out & about. It was only live in Harper's catalogue for less than 12 hours, & it started popping up everywhere. The pulled it, but it's been re-loaded all over. Thank youto those of you helping tell folks that it was NOT the final cover. This is . . . well, almost the final cover. The vines are still wrong, but the effects are in place now. I love it. Please, meet Donia (portrayed by Linda) on the cover of the final WICKED LOVELY book . . . LOVE the steam & sunlight. I can't wait to read about Donia! She is one of my favorite characters, and I'm excited to see how Melissa pulls together all the Wicked Lovely books! I'm a little sad, though, that it's going to be over! But at least it looks like there's a movie in the works! The Wicked Lovely Series screenplay is rumored to be written by Caroline Thompson who did The Corpse Bride and Edward Scissorhands, so that sounds awesome!! I plan on starting this series (finally, I know! I know!) this summer. These covers are just gorgeous. They're so seductive. My fav cover of the series, for sure! I haven't read this series yet. Been meaning too though. The cover is quite lovely. This series was amazing! Thrilling but heartbreaking in each characters minds throughout the story. BEAUTIFUL.